THE SOLAR SYSTEM -- AND BEYOND-- -- HOW BIG IS THE MILKY WAY GALAXY? When you look up at the night sky at night, every star you see is part of the Milky Way galaxy. On a clear night you can see a narrow band of stars stretching across the sky. Through a telescope or pair of binoculars it becomes clear that this band is a dense region of the Milky Way. The band of light we see as the Milky Way is the light that originates from stars and other material that lie within the galactic plane (Note: the galactic plane is the actual mid-plane – the flat part – of our galaxy’s huge spinning disk of stars). The disk of the Milky Way galaxy spans a distance of about 100,000 light years (one light year is about 9.5 x 1015 meters). The Milky Way galaxy though is only about 2000 light years thick at the edge of a spiral arm where the sun is located. Our Galaxy contains about 200 billion stars. Most of the stars are located in the disk of our galaxy, which is the site of most of the star formation because it contains lots of gas and dust. The Andromeda galaxy is a spiral galaxy much like our own Milky Way galaxy but is approximately 2.5 million light-years away. The Milky Way and the Andromeda Galaxy are a binary system of giant spiral galaxies belonging to a group of 50 closely bound galaxies known as the Local Group. 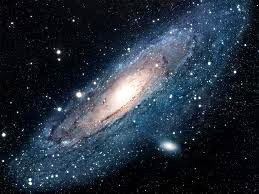 Andromeda is one of the few blue-shifted galaxies (moving toward us) at a speed of 100 to 140 kilometers per second and is expected to collide in about 4.5 billion years with our own Milky Way galaxy. An object moving toward us will have light shifted to the blue end of the spectrum. Objects moving away will be red-shifted. This is attributable to the Doppler effect. On a clear night you can see about 3,000 stars. This is only a fraction of the stars in the Milky Way galaxy -- there are approximately 200-400 billion stars in the Milky Way galaxy. Our sun and solar system is at the edge of a spiral arm called the Orion Arm, and is about two-thirds of the way from the center of our galaxy to the edge of the starlight. Just as the earth orbits around the sun, our solar system orbits the galaxy's center of mass -- but each rotation takes 225 million Earth years. This period of time is called a "cosmic year". What are the parts of the Milky Way galaxy? A spiral galaxy like the Milky Way has 3 basic components to its visible matter: (1) the disk (containing the spiral arms), (2) the halo, which extends beyond the disk, and (3) the nucleus or central bulge. The halo of the galaxy is rather spherical in shape and contains little gas, dust, or star formation. The clusters found in the halo are globular clusters, so the halo contains very old stars. (See reference for more information). What is in the center of the Milky Way galaxy? The center of the galaxy looks awfully bright from the image above. Perhaps millions of stars are in the center. But, radio telescopes tell us more. Observational data suggests that a massive black hole exists at the center of the central star cluster. The galactic center harbors a compact object of very large mass as determined by the motion of material around the center. The intense radio source named Sagittarius A*, thought to mark the center of the Milky Way, is newly confirmed to be a supermassive black hole. [See reference below] Most galaxies are believed to have a supermassive black hole at their center. What's beyond the Milky Way galaxy? The Milky Way galaxy is just one of probably several hundred billion galaxies in the observable universe. The image on the left shows the part of the universe that is within 5 million light years of earth. 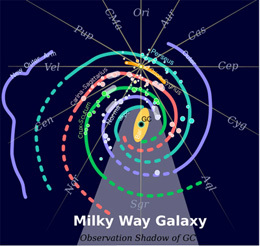 The Milky Way is shown as one of three large galaxies that belong to the Local Group (Milky Way galaxy, Andromeda galaxy and Triangulum galaxy). A visit to the site atlasoftheuniverse will let you zoom in and out and give you a better feel for where earth lies in the universe. 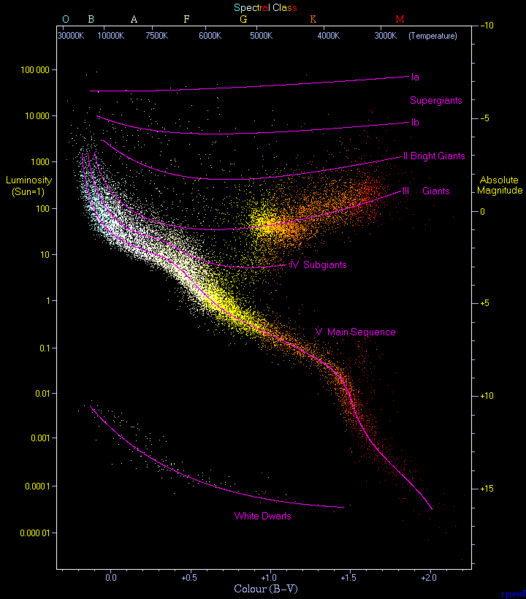 1) How many stars does our galaxy contain? 2) How thick is the Milky Way galaxy? 3) How long is a cosmic year? 1. If one light year is about 9.5 x 1015 meters, what is the approximate diameter of the Milky Way galaxy? When Galaxies Collide - In 4 billion years the Milky Way and Andromeda Galaxy will pass through each other. Milky Way galaxy lecture from University of Oregon -- excellent read for more advanced students. This lecture page also has a quiz attached at the end of the text. An Atlas of the Universe -- This web page is designed to give everyone an idea of what our universe actually looks like -- It's a great piece of work!